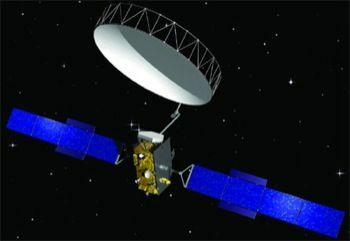 Testbed communications satellite, a joint project between the European Space Agency and Inmarsat. AKA: Alphasat. Status: Operational 2013. First Launch: 2013-07-25. Last Launch: 2013-07-25. Number: 1 . Demonstrated a laser communications system and radio communications links in Q and V band; carried an operational extended L-band payloadto supplement Inmarsat's satellite broadband capacity. First flight of the new Astrium/Lampoldshausen 500N EAM (European Apogee Motor), a MON/MMH system with an Isp of about 325s. Dry mass iaround 3500 kg. Family: Communications. Country: USA. Launch Vehicles: Ariane 5, Ariane 5ECA. Launch Sites: Kourou ELA3. Bibliography: 6339, 12043. 2013 July 25 - . 19:54 GMT - . Launch Site: Kourou. Launch Complex: Kourou ELA3. LV Family: Ariane 5. Launch Vehicle: Ariane 5ECA. 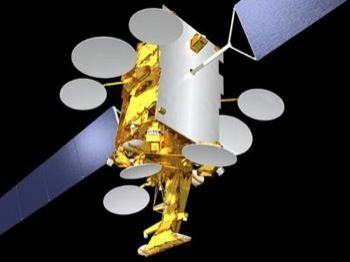 Alphasat - . Payload: I-4A F4. Mass: 6,500 kg (14,300 lb). Nation: USA. Class: Communications. Type: Communications satellite. Spacecraft: Alphabus. USAF Sat Cat: 39215 . COSPAR: 2013-038A. Apogee: 35,796 km (22,242 mi). Perigee: 35,777 km (22,230 mi). Inclination: 0.40 deg. Period: 1,436.09 min. Testbed communications satellite, a joint project between the European Space Agency and Inmarsat. Demonstrated a laser communications system and radio communications links in Q and V band; carried an operational extended L-band payloadto supplement Inmarsat's satellite broadband capacity. First flight of the new Astrium/Lampoldshausen 500N EAM (European Apogee Motor), a MON/MMH system with an Isp of about 325s. Dry mass iaround 3500 kg. By July 30 Alphasat was in a 25608 x 35809 km x 0.3 deg orbit.